Devlog: Onward to the Beta Version ! Hi there ! Devlog time ! First of all, sorry for the weird rotating bullets in the previous release, it’s caused by the rotating warpgates code added a bit in a hurry. I am not going to publish a fix just for that graphical glitch even if it’s fixed by now, making a new release takes roughly a full day and given the current circumstances (which aren’t going any better), I’d rather spend my free time coding toward the next version which will be labelled as Beta 1. Yes, the official beta version is on it’s way, and that’s what we’re going to discuss here. First of all, let’s review the new features added this week, there’s quite a few of them. 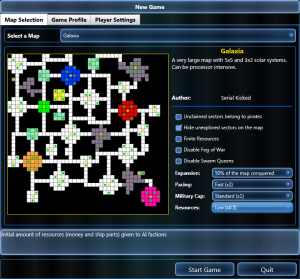 A lot of options have been added to the map selection screen. 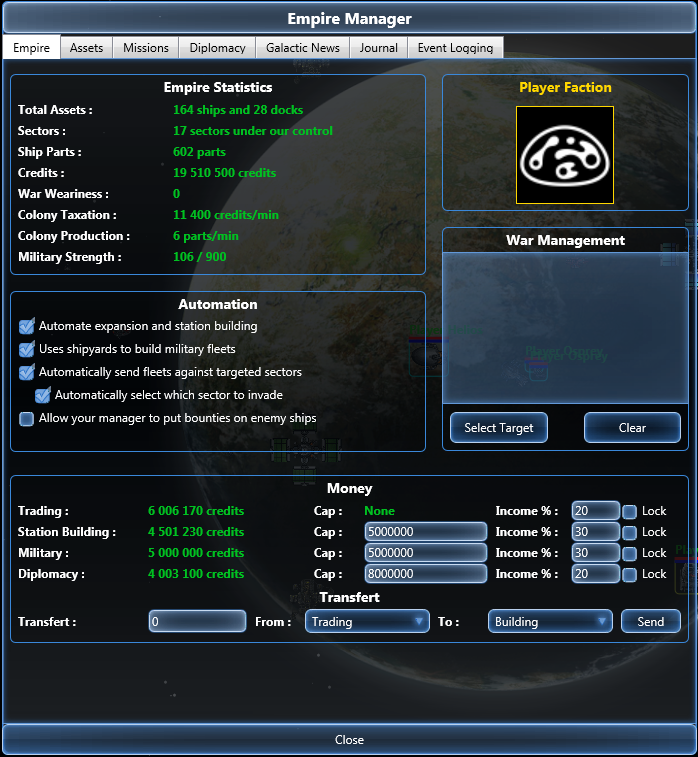 It is now possible to set the initial resources (money and ship parts) of the AI factions, the general pacing of the game (factory/shipyard production speed, colony taxes, station building time, …), and the maximum amount of military ships that can be in game, All those settings have a low, standard and high value. It is also possible to set how much of the map has been conquered when the game starts. 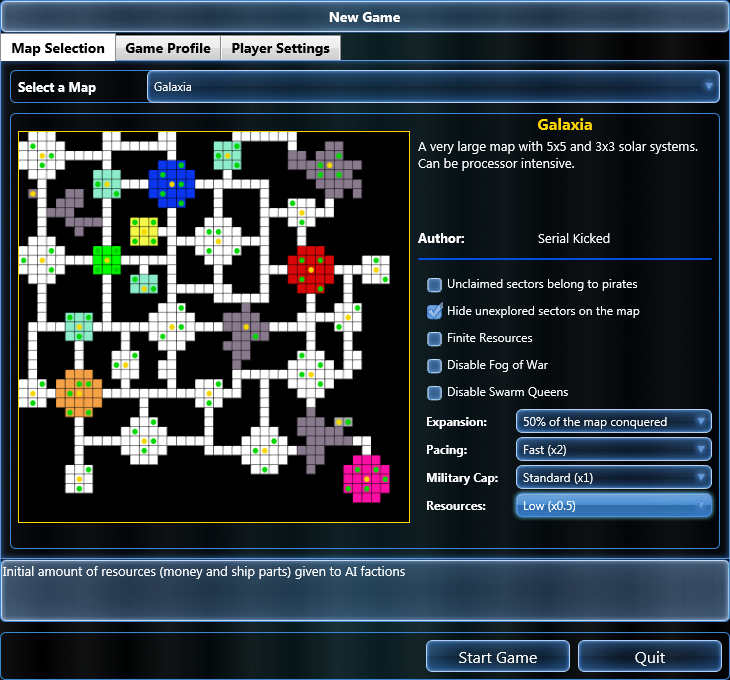 Right now, it’s possible to choose between a fully conquered map (with or without the player), a 50% conquered map, or whatever the selected map offer as a starting position. 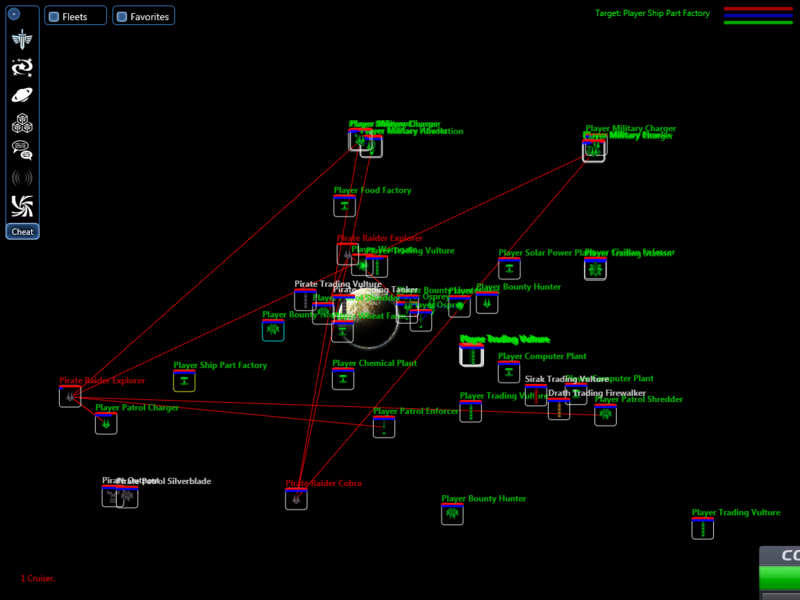 I also fixed the “hide unexplored sectors” setting and added the “fog of war” option. I will explain both further down. The last obvious missing culprit is a victory condition which I will add later on. 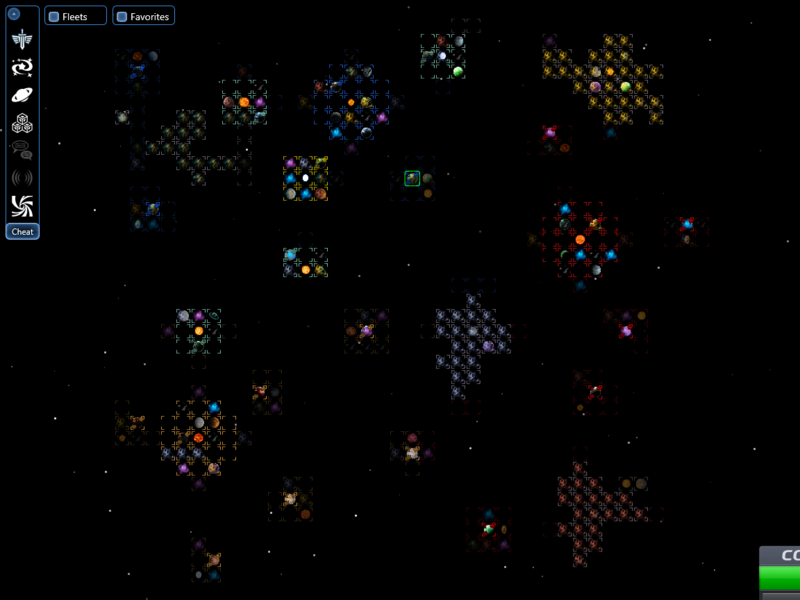 You can now hide unexplored sectors (well, you could before, but it wasn’t working properly). 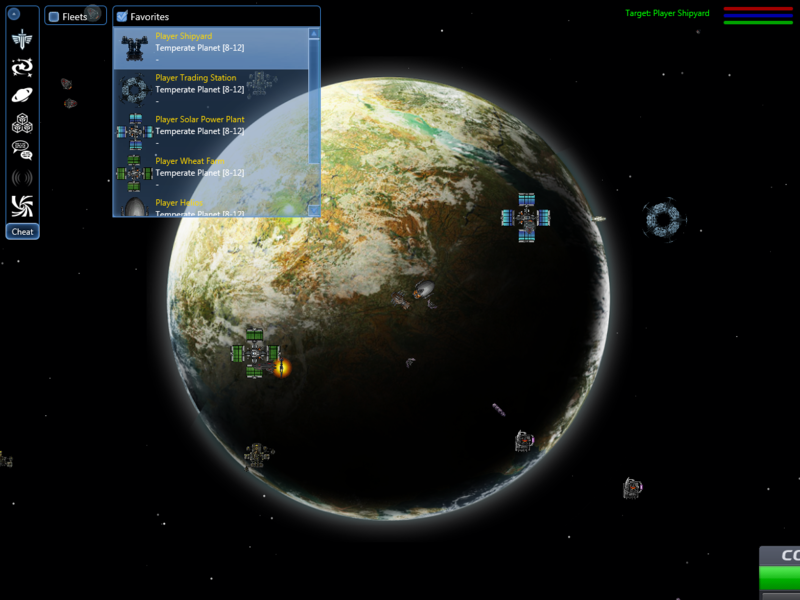 If checked, this option will hide all sectors on the map apart the capital solar system of each faction, the capital planet of each system owned by a faction, and of course your own sectors if you start as an empire. By looking at the galactic map you can see that neighboring, unexplored sectors appear in slightly dark tones so you don’t have to “hug” the sides of each map to find adjacent sectors. 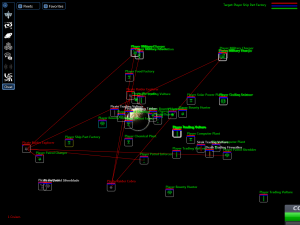 The fog of war option is pretty straightforward, it will hide the content of the sectors you don’t have assets in. However, once revealed, factories and stations will stay that way as they are non moving objects. 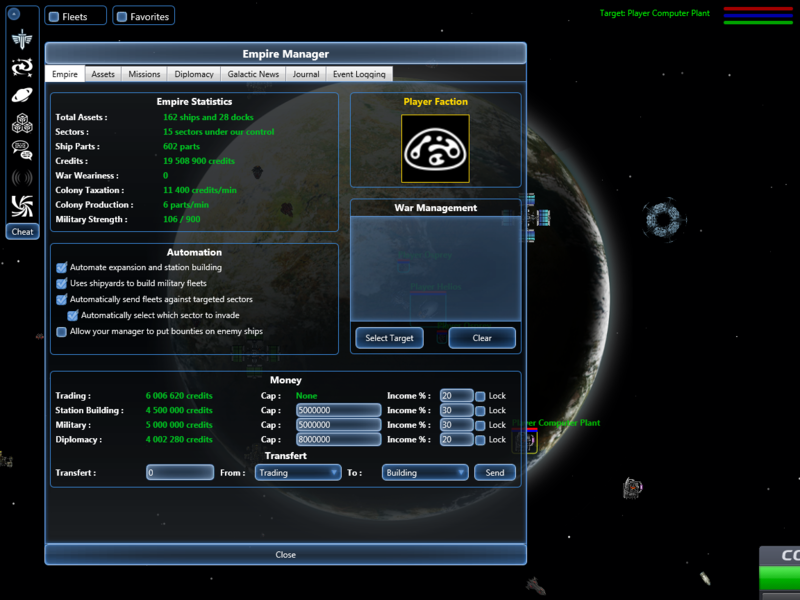 I added, next to the fleet widget, a similar looking menu. It’s there so you can bookmark some of your assets for a quick access. 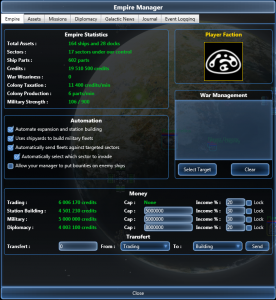 Contrary to the fleet menu, you can add there basically anything produced by your empire: shipyards, stations, factories or ships. Double clicking an object added to the bookmarks will open its setup menu while a single click will select this object so you can give it orders, center your camera on it and so on. Nothing is free anymore ! Both you and the AI factions will have to buy the stations and factories you build. As such I did a first pass at balancing all prices (ships, equipment and docks). This new feature is going to be a bit harder to explain. Instead of having a single “account” to handle your money, you’ll get four. One for general trading, one for station building, one for military buildings, and one for diplomacy. And yes, I understand it’s a bit confusing. The reason for this change is that AI factions were extremely bad at handling their money when low on funds. And as a result, your managers in the automation menu were too. So I had a choice between rebuilding the whole economic part of the faction AI from the ground up, which would take an undetermined amount of time, or find an alternative. This is it. Basically, you can set a cap for each account and decide what percentage each account will receive when you get some money from trading or any other mean. It is also possible to transfer money between accounts freely. As a result, your managers won’t go overboard with expenditures you can’t really afford. It also ensure that the AI factions won’t spend all their money building solar power plants when they really need a new shipyard instead. In no particular order. The bloom filter is working (more or less) properly now and doesn’t impact the frame-rate as badly as it did before. I added a few buttons to the factory setup menu to apply the same settings to all factories and to all of the similar ones. It is possible to pay your bounty. I redesigned and added a few options to many of the other menus. The “quit to main menu” option actually does that instead of going back to the splash screen. Holding the shift key shows the health of all visible assets on screen. And, I fixed a few bugs found in the last version. – I need a better sound library, the one I am using is okay(-ish) for music, but it won’t do with sound effects, it’s not a big deal in itself, but it will take some time to experiment with the various available ones. – I am not satisfied with the way factions expand into neutral / uncharted territory. It’s way too artificial at the moment. I am thinking about something more akin to the cultural system found in many 4X games. – Collision detection need some love. – Some diplomatic treaties and options are still missing or need to be improved upon. – The ability to transition from the “pilot” phase to the “empire” phase properly. There’s plenty more, but those are a the major ones. The game is also lacking actual content (missions and such) but that’s for when we have reached the beta phase itself. 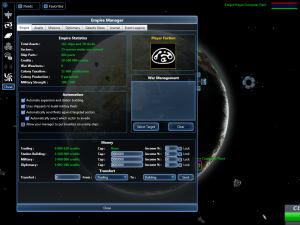 Unending Galaxy 0.7.4 Released !